Walter Isaacson’s fascinating new Steve Jobs biography focuses largely on the Apple co-founder’s technological innovations and his personal life, but there are some fascinating nuggets about Jobs’ lifelong fascination with rock & roll. The book delves into his intense obsession with Bob Dylan, his romantic relationship with Joan Baez, his perception that John Mayer is “out of control,” the difficulty of getting the Beatles on iTunes and his close (and occasionally turbulent) friendship with Bono. • In 1982, Jobs was introduced to Joan Baez by her sister Mimi Farina. He was 27 and she was 41. “It turned into a serious relationship between two accidental friends who became lovers,” said Jobs. Some of his friends believed that one thing that drew Jobs to Baez was the fact that she used to date Bob Dylan. “Steve loved that connection to Dylan,” said Jobs’ college friend Elizabeth Holmes.” The relationship fizzled out when it became clear that Jobs wanted children and Baez did not. • Bono personally negotiated the deal to have Apple feature U2’s “Vertigo” in one of their iPod commercials. Jobs was resistant because the iPod commercials only feature silhouettes, and never recognizable people. “You have silhouettes of fans,” Bono said to him. “So couldn’t the next phase by silhouettes of artists?” Jobs relented, but in 2009 they were unable to come to a deal to feature “Get On Your Boots” in another commercial. 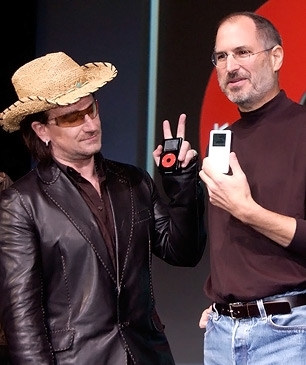 Jobs also refused to print (APPLE) Red on the U2 iPod because he didn’t want Apple in parentheses. “But Steve, that’s how we show unity for our cause,” said Bono. The argument got heated – to the “F-you stage” – until they compromised on (Product) Red. Previous PostPrevious Tangled Up in Blue: What was Bob thinking?